The Sultan Ahmed Mosque continues to function as a mosque today; men still kneel in prayer on the mosque's lush red carpet after the call to prayer. 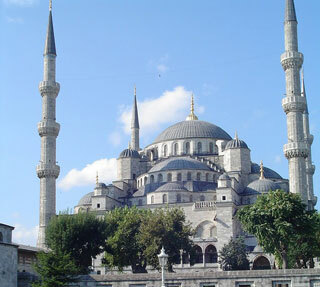 The Blue Mosque, as it is popularly known, was constructed between 1609 and 1616 during the rule of Ahmed I. Its Külliye contains Ahmed's tomb, a madrasah and a hospice. Hand-painted blue tiles adorn the mosque's interior walls, and at night the mosque is bathed in blue as lights frame the mosque's five main domes, six minarets and eight secondary domes. This article uses material from the Wikipedia article " Blue Mosque", which is released under the Creative Commons Attribution-Share-Alike 3.0 License.